Facebook is one of the most popular social media sites and often misused by scammers to attack maximum users. Hoaxes are a common practice on Facebook, just like the recent one, in which apparently Mark Zuckerberg is sending private messages to users. 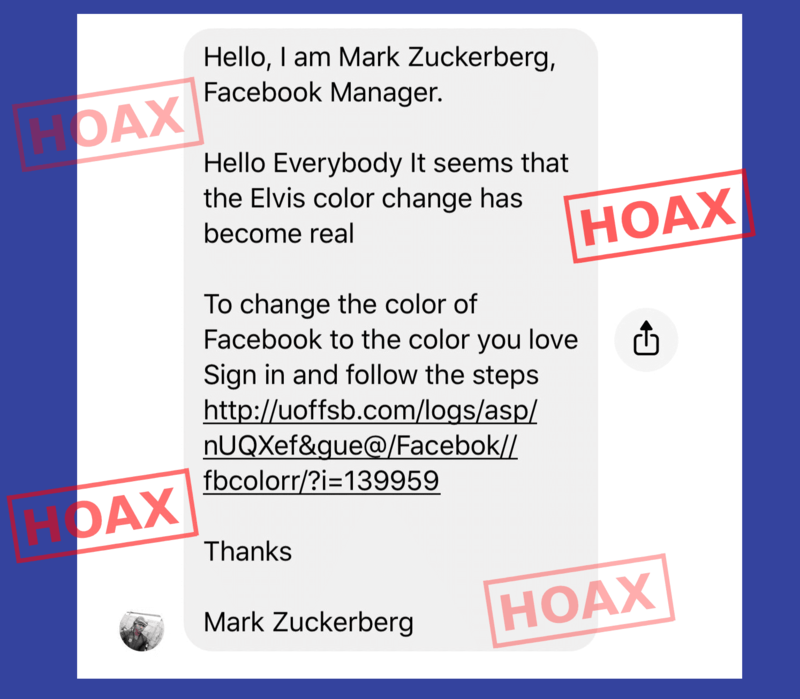 As noted by Matt Navarra, a message has been circulating on Facebook and Messenger, which appears to be from Mark Zuckerberg, in which he is asking to follow a link and get to change the color of your Facebook, from blue to the color of your choice. It is obvious that these messages are only hoaxes and hold no authenticity. The only purpose of these is to waste your time and irritate others by forwarding it to them. Some of the ways to identify hoaxes are that Facebook or Mark Zuckerberg will not send a private message, telling about terms and conditions or features, neither will ask to forward to friends. Rather a pop-up box will appear to everyone right after logging into Facebook or within the newsfeed. There will be no obvious grammatical or punctuation errors in the official message. There will be no condition of bringing changes to Facebook layout or features. There is no point in wasting time and thinking about hoaxes. Ignore any such messages or report them to Facebook and avoid sending them to your friends and followers. As a safety precaution read Facebook's official guidelines on "How do I avoid scams" and "What can I do to keep my Facebook account secure?". Facebook's Help Community is the right place "where you can connect with others to find and share answers to questions about Facebook.